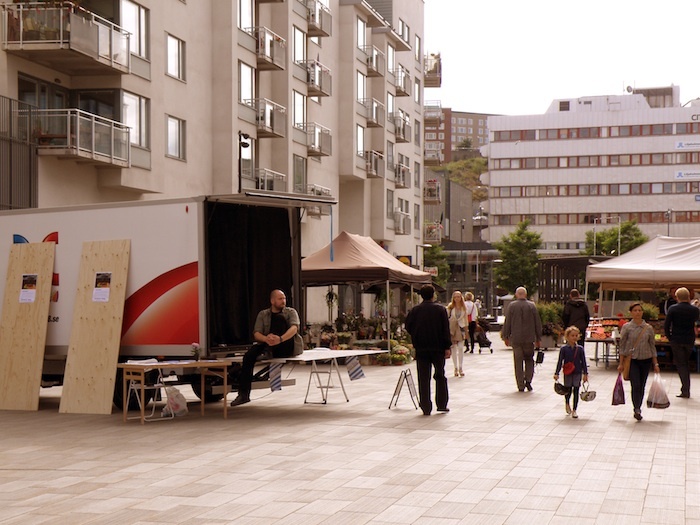 During one weekend, 18–19 August 2012, Melbourne contemporary art initiative BUS Projects collaborated with Färgfabriken, Stockholm to present an international mobile cinema and contemporary art performance space. 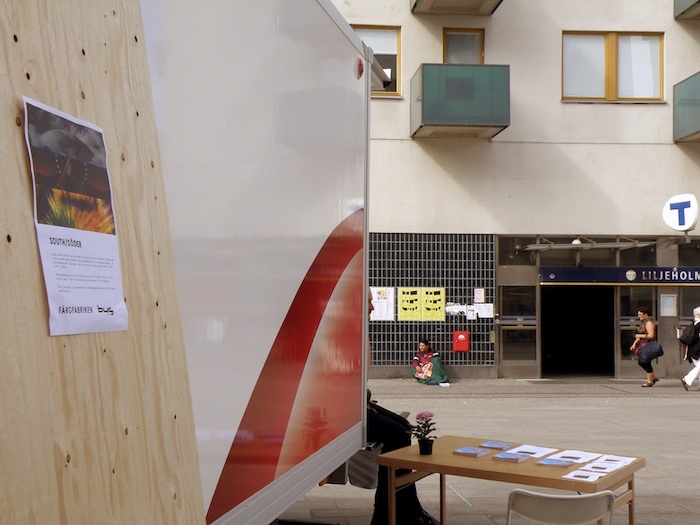 Making use of a parked van converted into a mobile event space, SOUTH/SÖDER was curated by Jared Davis and presented a new performative, video and sound-based work in the public site of Liljeholmstorget. This project drew from an ongoing series of mobile contemporary art and performance events initiated by BUS Projects, that have seen works presented in public sites in Melbourne (State of Design Festival, 2011), Athens (ReMap3, 2011) and Sydney (SafARI, 2012). For SOUTH/SÖDER, Australian artist Emile Zile exhibited for the first time in Sweden, continuing his work in the area of cinema as a social space, media archeology and live expanded cinema. 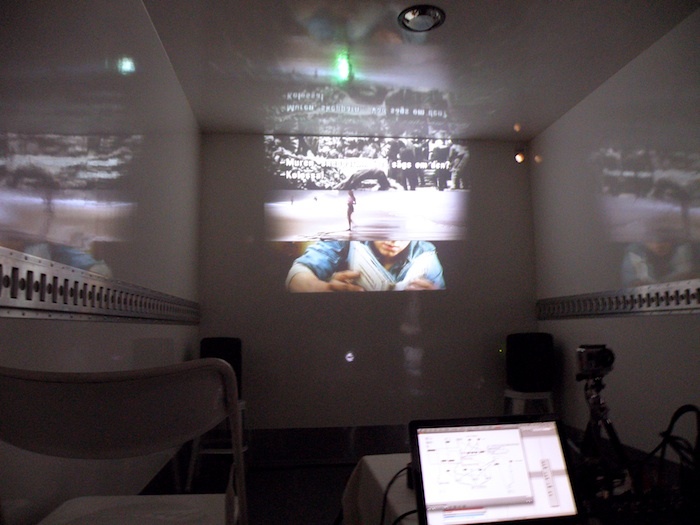 Zile presented a new cinema-based audiovisual performance that used three versions of the King Kong story (1933, 1976, 2005) to create a compressed re-telling of this famed cinematic narrative. Extracting separate subtitle tracks from the three feature films and recombining them within one frame, this was a formal observation of the mutations and re-animations of the same storyline in different epochs. The soundtracks of the three films were mixed live by the artist during the performance. Zile made use of the Swedish subtitle tracks of the films. Emile Zile – is an Australian artist, filmmaker and performer based in Amsterdam. He received a BFA degree from the Royal Melbourne Institute of Technology (Media Arts) Melbourne before relocating to Amsterdam in 2007 to commence an MFA degree at the Sandberg Institute. Building on a background of single-channel and performative video art, his current work focuses on portraiture, site-specific performance, short video and the use of the internet as a site for mourning, transgression and revelation. His body of work reflects a bleak humanism and dark wit, in the face of an ever-accelerating culture of image consumption and distribution.